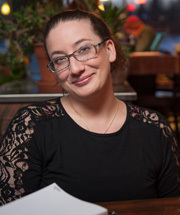 Rebekah Moras received her PhD in Disability Studies from the University of Illinois at Chicago in 2015, and has been an AUCD network member since 2002. Her dream is to be part of developing interdisciplinary disability studies curricula at the University of Alaska-Anchorage, in conjunction with cultural studies like Alaska Native Studies, and applied health science disciplines. Her loves are reading, coffee, dogs, and family, both biological and chosen. Transparency: I do not believe "healthy" people are more ethical, or that being "unhealthy", "disabled", or "fat", is immoral. Science cannot be completely "objective", but it is possible to make it transparent, humble, inclusive, and expansive.